From the year 1758 Hammarby was a haven for the Linnaeus family whenever they needed to get away from the noise and evil smells of the city. In 1758 Linnaeus bought the farms Hammarby and Sävja near Uppsala. Hammarby became the family's summer home but also represented security in the face of an uncertain future. Here they could keep farm animals and grow grain for bread, vegetables and tobacco. When Linnaeus died his house in Uppsala would revert to the new professor and Sara Lisa could move to Hammarby. At Hammarby Linnaeus could also grow plants that did not tolerate the damp and cold conditions in the botanical garden at Uppsala. On one occasion he was sent a large collection of Siberian plants by Catherine the Great of Russia. These were also planted at Hammarby. In the main building at Hammarby, with its ten rooms and a kitchen, Linnaeus papered the walls of his study and bedroom with plates from two works on flowers. You can still see them today. Both Hammarby and Sävja are open to tourists during the summer months. On a hillock in the park at Hammarby Linnaeus built a small, unheated house of stone. Here he kept his collections comprising tens of thousands of plants, animals and minerals, to keep them safe from possible fires and floods. He taught his private pupils in the little stone house that he called " my palace in heaven". Sävja is a smaller farm a few kilometres from Hammarby. Here Linnaeus arranged a small room, like a student's, for himself. When he wanted family, friends, enemies and inquisitive students to leave him alone, he used to go to Sävja. He liked to sit in the kitchen with the farmer's family and smoke his pipe in front of the fire, chatting about everyday matters. 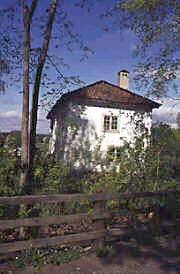 which Linnaeus built in 1762, is today an interesting museum.